Martin Luther King Jr. was an American activist and clergyman born on January 15th, 1929. He was the leader in the African American Civil Rights Movement. 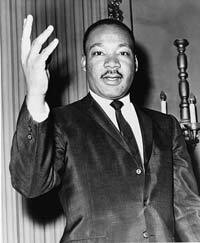 King was best known for his non-violent forms of civil disobedience. He is a known icon in the history of American progressivism and peace movement. He was awarded the Presidential Medal of Freedom as well as the Congressional Gold Medal. A U.S. federal holiday, which is still celebrated to this day, was declared in 1986 to commemorate him, known as Martin Luther King Jr. Day. King was born in Atlanta, Georgia to Reverend Martin Luther King Sr. and Alberta Williams King. He was the middle child; King had an older sister and a younger brother. It was said that King was skeptical of some Christian claims, when he was thirteen, he denied the bodily Resurrection of Jesus during a lesson in Sunday school. However, during college, he began his doctoral studies in systematic theology while he attended Boston University. He received his Ph.D. in 1955. King says that his main influence was Jesus. He would quote the Bible in many of his speeches and during religious meetings. King based his faith on one of Jesus’ commandments, which was “love your neighbor as you love yourself.” He wanted to do “God’s will.” This was stated during his famous speech “I’ve Been to The Mountain Top.” King was also inspired by Mahatma Gandhi’s non-violent activism. He used this as part of the protests and rallies that he headed. He studied Gandhi’s teachings along with his Christian faith. The Montgomery Bus Boycott of 1955 was led by King. He was arrested during this campaign; however, it led to the end of racial segregation on all Montgomery public buses. He was also involved in the Albany Movement which was a desegregation coalition in Georgia. This was held in November of 1961. Two years after that, King began a campaign against racial segregation as well as economic injustice in Alabama. He was arrested and jailed during the early part of the campaign. This is where he wrote his now-famous letter while inside his cell, “Letter From Birmingham Jail.” This was a call for movement, which inspired many to fight for social change. During the same year, King was one of the “Big Six” in the civil rights organizations who was responsible for the March on Washington for Jobs and Freedom. This was an event that was meant to point out the oppression and desperate conditions of African Americans in Southern United States. King escaped death during the Southern Christian Leadership conference during the 1950’s when a mentally ill woman tried to stab him with a letter opener while he was signing books. In 1964, while addressing a rally, right after delivering his “I’ve Been to The Mountain Top” speech, he received a bomb threat on the plane he was supposed to board. King was then booked in a motel. The next day, on April 4th, 1968 a shot was heard from the second-floor balcony of his motel. A bullet had entered his right cheek and lodged in his shoulder. This assassination led to nationwide riots in Washington, Chicago, Kansas City and other areas.